BMW ORACLE Racing Race Training in Lorient. Today began the second week of training from Lorient, on France’s Brittany coast, on board the 60-foot multihull Groupama 2. The team is match racing against the 60-foot trimaran, Banque Populaire, as part of the preparations for the 33rd America’s Cup to be raced in multihulls. Today in brisk late spring temperatures and brilliant sunshine, the 60-foot multihulls match raced in a 6-10 knot southerly sea breeze. 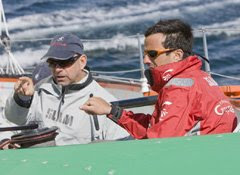 Groupama 2 skipper Franck Cammas, who is working as a consultant to the U.S. America’s Cup challenger, was at the helm today with John Kostecki calling tactics.